American Hairless Terrier puppies and dogs are lively, affectionate dogs that make excellent companions for any type of person. As intelligent, alert and playful dogs, this breed gets along well with children, especially if they are raised alongside them from puppyhood. American Hairless Terrier puppies and dogs are naturally inquisitive but can also be territorial. They need an owner who can understand how to be a leader, which will curve any negative behaviors. Unlike most dog breeds, AHT’s will break out in a sweat when hot or scared. These dogs are not known to be good swimmers and should be carefully watched in such situations. American Hairless Terriers make good watchdogs and, for the most part, are friendly with strangers. Ratting is not recommended because of the increased vulnerability brought on by the lack of a protective coat. 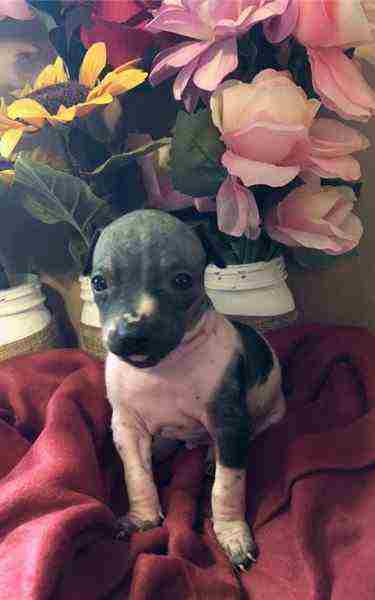 American Hairless Terrier puppies and dogs are eager to please and display a temperament that is pure terrier – they are lively, feisty, playful and fearless by nature. 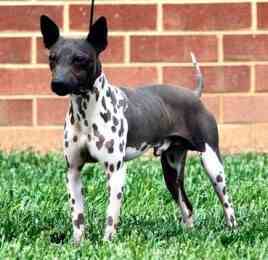 To find an accurate representation of the breed, only select reputable American Hairless breeders. As a hairless breed, American Hairless Terrier puppies and dogs do not shed, will not get fleas and are very good for allergy sufferers. They do shed skin cells about every 20 days so some minimal dander can be expected. If AHT’s skin becomes dry, lotion without lanolin can be applied. American Hairless Terrier puppies and dogs should be bathed one to three times a week and their nails should be trimmed weekly as well. Since they lack a furry coat, care should be taken to prevent sunburn and to keep these dogs warm in cold weather. American Hairless Terriers tend to forget that they lack a protective coat and will romp outside, obtaining occasional cuts and scratches. These should be attended to with hydrogen peroxide or any other antiseptic agent. American Hairless Terrier puppies and dogs do not have absent premolars or the typical breeding complications common with hairless dog breeds. Additionally, this breed does not experience the major skin problems commonly found in hairless dogs. They do have sweat glands, which will cause them to get pimples, but these will go away on their own. American Hairless Terrier puppies and dogs will sometimes get a rash on their skin and rashes from grass allergies. This is not that uncommon. Other allergies can also occur. Since they lack hair, these dogs should be protected from the sun with sunscreen or a shirt. Wearing a shirt may also help protect them from the cold. Like most terriers, this breed of dogs enjoys playing challenging games and romping outdoors. American Hairless Terrier puppies and dogs are fairly active indoors but should be taken on a long daily walk. They will do ok in an apartment as long as they get at least 20-30 minutes of exercise a day. American Hairless Terrier puppies and dogs should have a small to medium sized yard, but be watchful, they love to dig. These dogs will not drool at the mouth or pant in order to balance their body heat since they have sweat glands. Due to their lack of coat, they should wear a sweater in cold weather. American Hairless Terriers have a life expectancy of 14 to 16 years. Because they are eager to please, American Hairless Terrier puppies and dogs seem to train easily. During training, keep in mind that small dogs, such as the AHT tend to lack in human leadership so being a strong pack leader is essential.